4) Between art making and viewing - Questions on the aesthetic experience : In contemporary times we have seen a overthrow of our traditional conceptions of what an art object should be made of and what it should look like. The artwork is now a process rather than a material thing- this ‘new aesthetic will be explored and discussed. 5) issues of Context, Language and Appropriation - Dialogues between the Personal , Local and the Global: The focus will be on understanding the Re-presentation, Gaze, Hybridity, Appropriation and Re contextualization as important critical categories though with art is viewed and appreciated. • Sharing each portfolio sharing, discussion and critical analysis. 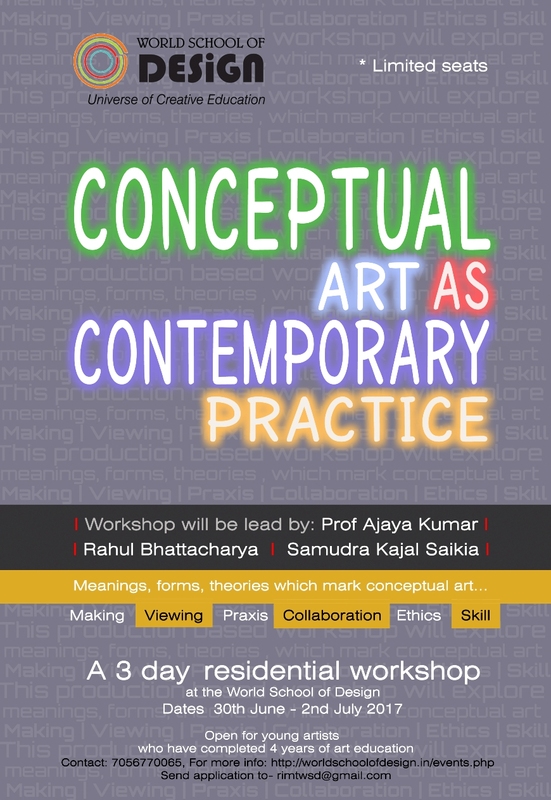 • Presentations and video sessions to understand the development of conceptual art especially in the developing nations. • Day long sessions and exercises at public spaces using various mediums as aesthetic/communicative tools and learning how to take feed back. • Developing ideas into art – One to one intimate sessions with participants on how an idea can be developed, edited, and materialized into art through personalized understanding of media and skill. • Free flowing Discussion sessions – We will have non hierarchical open discussion sessions addressing all kinds of doubts and encouraging experimentations. Each day will have 5-6 six hours of working in a public space – Mornings will be time for discussion sessions and site mappings – Evenings will have portfolio sharing by participants and presentations by the workshop conductors. Followed by film/video screenings and free flowing discussions. Each day a new medium will be given the spotlight but will be connected to other mediums as we explore the threads the link practices as being conceptual. Open for students who have completed 4 years of art / design education and have not completed their post graduation studies. Preference will be given to students who have just completed their graduation. The workshop is free for participants including material charges.